On this page, you’ll find the basics about Mombasa travel: getting there, accommodation, things to see and do, and practical travel information. The city of Mombasa is right on the Indian Ocean coast. It's the second largest city in the country, which doesn't mean Mombasa travel options are second-rate. Most visitors use Mombasa as a hub to the beach resorts on the Indian Ocean coast, and Mombasa’s beaches are indeed great. But Mombasa has a lot more to offer. The region is home to the world famous Swahili culture – the cultural mix coming from thousands of years of interactions between African, Arab, European and Asian peoples in the region -, historical towns and ruins, and some fine nature, wildlife and marine parks. Most visitors come in through the small Moi International Airport in Mombasa. Since most intercontinental flights go to Nairobi, however, it often means getting a connecting flight (with e.g. Kenya Airlines) to Mombasa. Only a smaller number of European chartered flights, as well as flights from Kenya’s neighbors, go directly to Mombasa. Here's more about available flights to Kenya. From Nairobi, a cheaper option – and quite enjoyable – is taking the overnight train. The first class (3,100 KSH) has 2-person sleeping compartments while the second class (2,300 KSH) has 6-person sleeping compartments. If you’re on a very tight budget, you can take one of the dialy buses for 600 to 1000 KSH. If you have your own vehicle, then take the Nairobi Mombasa Highway (if you can call it that). Hotels of all kinds available directly in the city, and along the famous beach coastlines (north and south). Hotels in the city are usually fairly simple and many do not offer the luxuries that you might find in a beach resort, but they also have a lower room rate. The Royal Court Hotel is a good value choice, near the railway station and Old Town. You'll pay for the privilege of staying at a high-class beach resort like the Serena Beach or the Sarova Whitesands resorts. You might consider it money well-spent, considering the beach and ocean views, activities and gorgeous rooms. Your Mombasa travel plans really should include some time at the beach, even if you don't book your rooms there. Here is my own list of best hotels in Mombasa and best Mombasa beach hotels. The beaches around Mombasa are everything you would expect from a tropical destination: white soft sand beaches with coconut and palm trees, and white beach resorts with waiters, cocktail bars and all the luxury you could want. There are quite some differences between beaches, though. E.g. 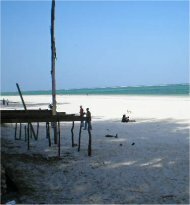 Diani Beach is very crowded with lots of activities, bars and activities, while e.g. Tiwi Beach only has a few small beach resorts where you’ll have the beach almost to yourself. Here are my Kenya beach reviews, as well as a general introdution to Kenya’s beaches. Throughout the coast region, you will find the traces of thousands of years of invasions by African, Arab and European peoples. In Mombasa’s Old Town, the history of the region comes alive in the pecular mix of African, Arab and European architectural styles. Very knowledgeable walking guides are available at a small charge. Fort Jesus, built by the Portuguese colonizers in 1593, is a real must as well. The fort, once a military fortification and a prison and now a museum, overlooks the Indian Ocean. If you’d like to go a few centuries back in time, also consider visiting Lamu island. It’s Old Town has earned it UNESCO World Heritage status and there are no cars on the island. 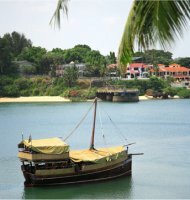 Mombasa travel isn't complete without having visited at least a few of these sights. If you are in Kenya for a safari adventure, you may find more nearby choices from Nairobi rather than Mombasa. And unless you’re taking a domestic flight, distance is important due to Kenya’s terrible roads. However, the Tsavo East and Tsavo West National Parks are located at a half days drive from Mombasa. Combined, they are the largest wildlife parks in Kenya, and due to their large open plains wildlife is easy to spot here. The parks are especially popular for their budget travel options. A little closer to the city is the Shimba Hills reserve, only 50km from Mombasa. It's a rain forest park, and home to elephants, antelopes and many more animals that you might not see in the plains environment of more northern Kenya parks. Additoinally, the Bamburi Nature Trail is just a short drive away from Mombasa. If you want to know about money, visa, health precautions and the like, please read my Practical Travel Information section.